Rye is a cereal grain similar to wheat but with a slightly different taste and texture. Like wheat, rye kernels are ground into flour for use in baking. 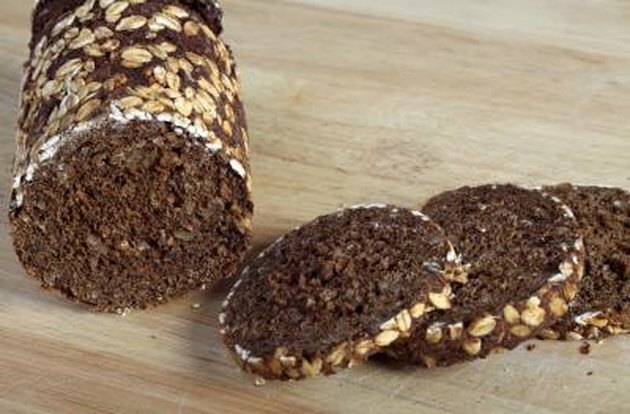 Traditional rye and pumpernickel breads contain rye flour of varying types and amounts. When milled as whole grain, rye flours contain higher concentrations of dietary fiber and other nutrients than refined wheat flour. Breads made with whole grain rye flour confer health benefits not associated with breads made from refined wheat flour. Many of the advantages of rye breads compared to white bread stem from the higher fiber content of rye flour. The Whole Grains Council reports that whole-grain rye contains nearly 15 percent fiber. Whole-grain wheat contains approximately 12 percent fiber and whole oats contain 11 percent. Dietary fiber includes of soluble and insoluble forms. Insoluble fiber predominates in rye flour, especially the whole-grain variety. Your gastrointestinal system does not break down insoluble fiber. It remains in your bowels and absorbs water, increasing the volume of your stool and preventing it from becoming too hard. These effects promote regular bowel movements and help prevent constipation. Whole-grain rye flour contains more soluble fiber than does its wheat-derived counterpart. Soluble fiber dissolves in your intestines and binds cholesterol-containing bile. You eliminate fiber and bile in your stool, thereby reducing the absorption of cholesterol from your intestines. Increased intake of insoluble fiber from eating rye or pumpernickel bread instead of white bread may help keep your blood cholesterol level normal, thereby reducing your risk of heart disease. The amount of dietary fiber you consume, especially grain-derived fiber, affects your risk of developing type 2 diabetes. In a January 2010 article published the "Journal of Nutrition," epidemiologist Beth Hopping and colleagues report that consumption of grain fiber significantly reduced the risk of type 2 diabetes among more than 75,000 study participants followed for 14 years. Choosing whole grain rye or pumpernickel bread instead of white bread may reduce your risk of type 2 diabetes by boosting your intake of grain fiber. White bread has a high glycemic index and typically causes a spike in your blood sugar level, which is problematic if you have diabetes. Rye and pumpernickel breads have a low to medium glycemic index, depending on the ingredients. This means that rye and pumpernickel breads are less likely to increase in your blood sugar level compared to white bread. The ingredients in rye and pumpernickel breads vary considerably, especially in products from commercial bakeries. Many brands contain a mixture of wheat and rye flour in varying proportions, which may or may not be made from whole grains. The most healthful rye and pumpernickel breads contain whole grain flours. Look for the words "whole grain rye" on the label or in the ingredients. How Many Calories are in Whole Wheat Bread? Is Rice Flour Gluten Free?